The Children’s & Teen Health Summit is for parents, caregivers and the children and teens they care for. This free, online conference will address a diverse buffet of topics during a week of interviews with leading experts in many health fields. Join our therapist Emily Roberts MA, LPC and 25 experts in mental health, pediatrics and wellness to learn how to improve the health and well-being of our children at The Children’s & Teen Health Summit. Come listen to The Children’s & Teen Health Summit for FREE and be inspired from September 14 – 20, 2015! Join the (R)evolution from the comfort of your home and learn invaluable information, as well as get some awesome free gifts from presenters. 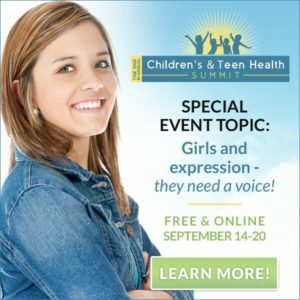 What is The Children’s & Teen Health Summit? This is a fantastic opportunity. You can listen to over 25 experts talk about the information you’ve been searching for to help you and your family. What could be more important than the health and well-being of our young people? ADHD, Autism, mood disorders, self-esteem, autoimmunity are on the rapid rise in our young population. Our children are now affected by obesity, diabetes, depression, addictions to sugar, media, and technology, the list goes on. Do you often ask yourself: What is happening to our kids?! What can I do to help the next generation? The answer is not medication or quick fixes; it is about building health from the roots, nurturing and caring for our children, mind, body, and spirit, and giving them the tools they need to care for themselves and each other. By sharing information and lending support to each other, we can most certainly do something about this which is why The Children’s & Teen Health Summit was created. Join us online from September 14 – 20, 2015! Listen to my free talk (which is awesome by the way on Tuesday September 15th, but you’ve got to register here to watch the presentation. Also when you sign up you get 20, yes 20 free gifts! Better yet, if you register today, you’ll have access to the following FREE GIFTS from the first bi-annual event that took place in March as soon as you register! Pedram Shojai’s talk, “Vitality for Our Children!” which discusses how we can raise vital children in mind, body and spirit. Reed Davis’ talk, “Uncovering the Root Causes of Childhood Disease,” which explores the most common childhood health complaints and what might be causing them. “Join the Integrity Food Movement! For Your Health and the Health of Your Children!” a PDF by Joel Salatin, a passionate call to action and argument for why we absolutely need a revolutionary shift in how we view food. So what do you have to lose? Sign up today and learn how you can improve the health of yourself, those you love and the next generation.